Rocket is an easy to grow salad crop, and as the name suggests quick growing for early results. Home grown rocket keeps well in the fridge, and you can just pick what you need on a daily basis much better than the supermarket bags of rocket which are expensive and short lived. As shown in the images, Rocket is made up of lots of small individual plants which means it is best grown from seed as it would be expensive to buy dozens of plants. The good news is that it is very easy to grow from seed, and to save seed for use next year. Sow rocket in either shallow drills or blocks. The seed should be sown evenly, not too sparsely and quite shallow around .5 cms (1/4") into prepared ground. The area for growing Rocket should be well raked so the earth is fine, and water well after sowing. Rocket can be sown from March to September, and to reduce gluts a good rule of thumb is to sow each fortnight. If you garden in an exposed area, or the spring weather is poor, delay early sowings until April. Rocket likes a sunny site and will also tolerate partial shade. Because like lettuce, it can bolt and go to seed if it gets too hot for too long, growing Rocket in partial shade may help to avoid bolting. The flowers, illustrated above right should be removed if you want to keep the plant growing and for it not to set seed. The flowers are edible and can make an attractive addition to a salad. Ensuring the crop is well watered may help to stop it bolting in warm spells. Rocket can be ready to harvest within 4-6 weeks of sowing, and can be grown as a cut and come again crop. The growing time for Rocket, as with lettuce, can be extended at the end of the growing season by covering the crop with a cloche. Rocket can be troubled by flea beetle, but it not too much bother. It will make small holes in the leaves but they remain perfectly edible. In the supermarket, all Rocket tends to very similar fairly uniform. However there are different types of Rocket, which have slightly different shaped leaves and degree of pepperiness in the flavour. Which to grow is a question of personal taste, all are fast growing and have the same growing requirements. Both cultivated and wild/herb Rocket,illustrated below, are easy to grow and both have the lovely peppery taste which Rocket is famed for. It is a question of personal taste, I find the cultivated rocket has more leaves and less stems and makes for a better salad but there is room for both in the veg garden. 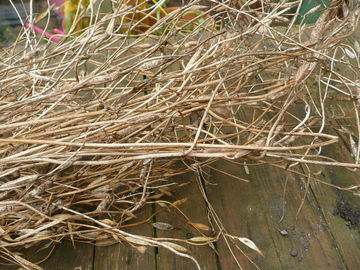 This is Rocket which has been left to dry with the seed heads in tact so that the seed can be harvested for next year. If you look closely at the image, there are small elongated seed pods which in fact contain lots of seeds, which are small and black. To save the seed, scrape them out of the pods when completely dry and save into small packets. It is preferable to use paper rather than plastic which has a tendency to create moisture which will destroy the seed. Label and place the seeds in a cool dark place, fridge or garage are ideal and the seed will be ideal for sowing next year.